Aunt Lessie married my maternal grandfather’s brother Robert Lee McKenzie and they raised two sons. Unlike numerous women of her generation, she worked outside the home—first as a school teacher in various elementary schools, and then as a principal. This week’s prompt is “Strong Woman” in recognition of Women’s History Month. Even though Lessie isn’t my blood kin, her strength of character made her a perfect choice. Lessie graduated from Roberdel High School and went to college for her teacher training. Her first teaching job was at Bayview School in Wagram, Scotland, North Carolina. After a year she went back to Richmond county and taught for two years at Cordova Elementary and five years at Roberdel Elementary. It was during her years at Roberdel that she married and had children. Lessie and Robert Lee McKenzie (1893-1949) married in Rockingham on 10 August 1914 by Rev. S.J. McConnell (a supply pastor for the Roberdel Circuit of the Methodist Church) at the parsonage. Robert was a wholesale grocer. They had two sons: Robert Benton “Ben” McKenzie (1915-1996) and John Culberson McKenzie (1917-1992). In 1918 Lessie began teaching grades 4 and 5 at Rohanen. Named after three mills: Roberdel, Hannah Picket, and Entwistle. The school started as four rooms and kept growing until the mills finally chipped in and built a two-storey building. She became principal at Rohanen in 1922. 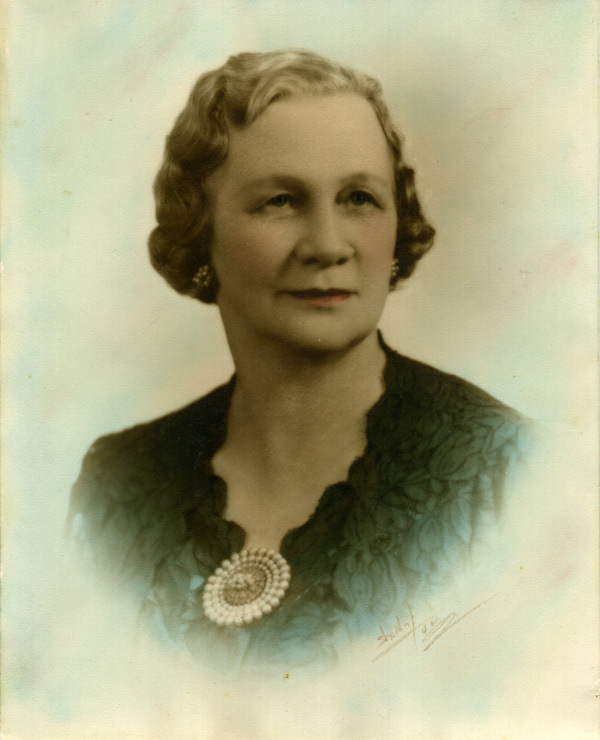 In 1925, she was named principal at Cordova school and remained there for three years. In 1928 she taught second grade at PeeDee school for a year before returning, in 1929, to Rohanen where she was principal until she retired. When depression hit, Lessie’s young family moved in with her parents and sister Jane. After her parents died, Jane continued to live in the house, and Robert found a new place for his family in Roberdel. Her sons went off to college in the 1930s, married in the 1940s, and the grandbabies started coming—six in all. Robert died 9 January 1949. He had suffered a stroke after a sudden heart attack in December 1944, but within a few months was able to return to work. The second attack (angina pistoris) was fatal. The funeral was held at First Methodist Church in Rockingham. He’s buried in Eastside Cemetery. “She was principal of Rohanen for as long as I remembered and retired at the end of the year when the first high school class graduated in 1954. She was a wonderful lady and I appreciate a lot of things that she did for me. She loved the students there too. Lessie McKenzie retired after accreditation was granted to Rohanen; her Elementary Principal’s certificate did not allow her to be principal of a secondary school. She moved to Pilot Mountain to be near her son John. I remember sometime in the 1960s she made a visit to Rockingham and I met her. I don’t remember much about it (being a shy introvert has its disadvantages), but I do remember she took the time to talk with me. Rohanen High School graduated it’s last class in 1972 (as did all the other county high schools). A consolidated county high school opened in the fall of 1972, joining all the high school students under one roof. The old high schools—Ellerbe, Hamlet, Rohanen, and Rockingham—became middle schools. Students still attend the school that Lessie McKenzie helped to build. Aunt Lessie died in Pilot Mountain on 15 December 1976 at the age of 84. Cause of death was ventricular fibrillation due to an acute myocardial infarction after 30 years of heart disease. The funeral was held at First United Methodist Church in Pilot Mountain with burial in Rockingham at Eastside Cemetery. Lessie Culberson McKenzie lived a long, fulfilling life, influencing the lives of her students in a positive way. I wish I had gotten to know her. This entry was posted in 52Ancestors, Culberson, McKenzie. Bookmark the permalink. Wow. I can see why you chose her. What an inspiration!